1029, HUBCAP USED, 15", 70, BUICK, LESABRE. POLISHED, 60 RIB TYPE. RAISED CENTER, PAINTED BLACK, FULL COLOR LOGO, METAL CLIPS. 1029, HUBCAP USED, 15", 70, BUICK, LESABRE. POLISHED, 60 RIB TYPE. RAISED CENTER PAINTED BLACK WITH FULL COLOR LOGO, METAL CLIPS. 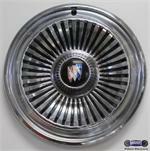 1083, Hubcap used, 14", 78-81, BUICK, CENTURY, POLISHED OUTER RING, MACHINED METAL CAP, 14 SLOT TYPE PAINTED BLACK, BLACK BACKGROUND FULL COLOR LOGO. 1957a- CHEV,, HUBCAP USED, 57, 14", CHEV, CHROME, 15 POCKETS PAINTED BLACK, CHROME 3 BAR SPINNER, RED, BLUE & GOLD CENTER, PUSH ON TYPE. 1957b- CHEV,, HUBCAP USED, 57, 14", CHEV, CHROME, 15 POCKETS PAINTED BLACK, 3 GROOVES IN MIDDLE OF CAP & BLACK CENTER & RAISED CHROME LOGO, METAL CLIPS. 1966-BUICK, HUBCAP USED, 15", BUICK, LESABRE, CHROME, 40 FINS, CHROME & PAINTED BLACK, WITH RAISED CENTER WITH BLACK CENTER & COLORED LOGO, METAL CLIPS. 643, Hubcap used, 14", 68, FORD, FAIRLANE, FALCON, CHROME OUTER RING, CHROME & BLACK, 64 RIB TYPE, MACHINED CENTER WITH CHROME & BLACK LOGO, METAL CLIPS, EXCEPT BLUE CENTER. 8030b, Used Rims, 15X7, 5 LUG, 5", 96-02, CHEVY, GMC, VAN, 1500, SUBURBAN, TAHOE, YUKON, PAINTED BLACK, STEEL. A-12, HUBCAP USED, 15", 1963, BUICK, LESABRE, 12 SLOT, ON OUTER EDGE, PAINTED BLACK & MACHINED FINS  MACHINED RAISED CENTER WITH 3 COLOR LOGO, METAL CLIPS.